Just when you thought it was safe to go back in the water... Five years ago, an expert sea diver and Naval Captain encountered an unknown danger in the unexplored recesses of the Mariana Trench that forced him to abort his mission and abandon half his crew. Though the tragic incident earned him a dishonourable discharge, what ultimately cost him his career, his marriage and any semblance of honour was his unsupported and incredulous claims of what caused it: an attack on his vessel by a mammoth, 70-foot sea creature, believed to be extinct for more than a million years. But when a submersible lies sunk and disabled at the bottom of the ocean, carrying his ex-wife among the team on-board, he is the one who gets the call. 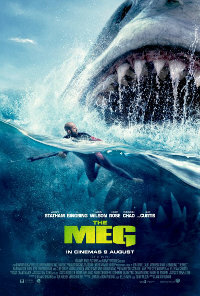 Whether a shot at redemption or a suicide mission, he must confront his fears and risk his own life and the lives of everyone trapped below on a single question: Could the Carcharodon Megalodon, the largest marine predator that ever existed, still be alive... and on the hunt? This film is releasing in 2D, 3D, 3D IMAX and 4DX. This is the 3D version. Language Moderate, infrequent, used to express fear/frustration. Violence Strong, fairly frequent, laced with threat and menace, within a action thriller context that contains suspense and some horror. 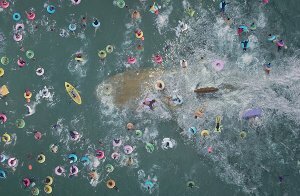 The film contains complex and mature themes of shark attacks, deep sea exploration, rescue missions, teamwork, loss/death, fear, sacrifice and redemption, within and action/thriller/horror context. There is a sense of threat and menace that is sustained through the use of suspense and some elements of horror which can be unsettling, distressing or upsetting for viewers below the age of 16. Viewers aged 16 and older may find the film of entertainment value, particularly lovers of the action/thriller/horror genre.